Transfer paper is a type of paper generally coated with pigment and wax. An inkjet or other specialty printer is used to print the design or image on the heat transfer paper. The transfer is then placed over the substrate such as clothing, bags, canvas, or other surfaces, under a heat press machine, which then transfers the image or design onto the substrate. a transfer paper is basically used in textiles, arts and crafts projects for creating iron-on products. A heat transfer paper is totally different from the ordinary paper due to its special coating and transferring quality. It has been specially designed for the purpose. Novices often get confused and end up purchasing an ordinary printer paper, which can ruin their project completely. You must make sure that you only use a heat transfer paper for your heat printing applications. Specially formulated inkjet sublimation inks are used for printing on Inkjet transfer papers. The ink is transferred from the transfer paper to the substrate by sublimation when the ink is heated to its gaseous state. This type of transfer produces a soft imprint feel on the fabric. It’s also used to print on specially-coated hard objects such as mugs, and many other decorative, utility and promotional items. Both warm and cold-peel sublimation process can be applied based on the substrate being printed. However, inkjet sublimation transfers can be applied only to polyester-coated objects, or clothing that has a high polyester content. As the sublimation ink is transferred in its gaseous form, the print can penetrate the polyester more like a dye, which is pretty much permanent. Laser printer transfer papers can also be printed using a standard inkjet printer. These transfers have a special coating for protection, which is transferred to the substrate along with the print. This type of transfer paper is used mostly for imprinting clothing and creates a bright print with a transparent, glossy coating. Always remember that laser printers can only print on laser printer transfers. Vinyl transfers are pre-coated with vinyl, from which the artwork or design is cut with a vinyl cutter connected to a computer with certain graphics software. The unwanted film on the transfer is then weeded, and the remaining transfer with the design is heat-printed onto a substrate. This type of transfer is better than direct screen printing, with a more durable, rubbery feel. Heat Transfer Vinyl is usually available in single colors and also there are some special options such as glittered, patterned, flocked, glow in the dark, holographic, reflective and 3D puff, to embellish items further. The specialty ink is coated on the vinyl transfer paper surface, which is transferred to the substrate by heat pressing. As there are several different types of transfers available in the market, choosing the right one can be a difficult job. Especially if it’s your first buy, it could be quite challenging. To make it easier, you can consider some basic factors while you are going for the buy. These factors will help you choose the right heat transfer paper best suitable for your task. While choosing a particular transfer size, make sure that its width fits in your printer or cutter. If it’s wider you may have to trim off the extra transfer manually, which can be time-consuming. Also, one of the basic parameters you should consider when looking for the best transfer paper is its length. The longer the paper, the better it’s for the application. It means there will be more room for the designs. You will, in fact, have more freedom and you can print larger designs. Sometimes due to the constraints of size, many users are forced to edit their artworks and make smaller designs. But with a larger transfer paper, you don’t have to worry about size. You’ll also have space to work on some extra designs and be more productive. Always choose a transfer of the highest quality. While considering the quality, you can ensure the quality and brightness of the ink and as well as the durability of the print. You would want a transfer paper that won’t cause any problem while working. It’s obvious that you would want to work as quickly as possible and produce as much as you can. Positioning and alignment can be your greatest challenge, so there are many heat transfers that come with grid patterns for making the transferring of the designs fast and easy. Another consideration is the ease of peeling off the transfer. For faster and more productivity, the transfer should be easy to tear off. Some transfer papers only work on specific materials. For instance, if you are looking to heat print on polyester, make sure the transfer paper is compatible with polyester. There are many high-quality transfers that work on varieties of materials and fabrics. In case you are going to work with a wide range of items, this type of transfer is ideal for your tasks. In addition, a good quality transfer paper can work with both wet and dry applications. Transfer papers are specific to garment color. If you are printing onto a dark color garment make sure your heat transfer paper is recommended for dark garments and vice versa if it’s for light garments. Also, make sure that the transfer color is contrasting to the color of your clothing. Price is not a very important aspect to consider, but high-end transfers are always better than the low-cost ones. Usually, transfer papers either come in sheets or rolls. If you have a large project to finish, it’s always profitable to go for rolls. Here are brief reviews of the top three transfer papers available in the competition. 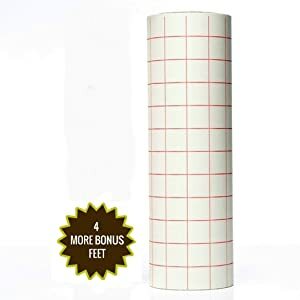 BestCrafts 12 inch by 10 feet transfer tape is a premium product that can effectively handle your project. Superior quality materials are used in manufacturing this product. The paper comes in a 10 feet long roll at a very reasonable price with higher quality than the low-cost imported brands in the competition. This is 4 feet longer in length than that of standard brands. This transfer paper tape is designed to work with varieties of adhesive vinyl; both outdoor and indoor. It can work with Silhouette, Cameo, Cricut Vinyl, Provo Craft, etc. It has perfect grids with visible red lines for easy transfer. Show off your artworks and creativity on white or light-colored fabrics using the Avery Inkjet Transfers. These iron-on transfer papers can feed perfectly through most inkjet printing machines. The color shield technology offers crisp image quality and bright colors that retain even after washing. If you want to personalize your t-shirts, pillows or tote bags with unique images, quotes, team names, and so on, this 8.5 by 11 inches heat transfer is ideal for all these and much more. The pack comes with 18 individual sheets at a very reasonable rate. 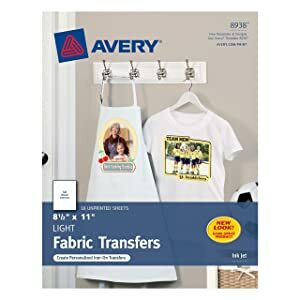 These transfers work great on light-colored 100% cotton or poly blend fabrics, and you will get a high-quality and professional result every time. 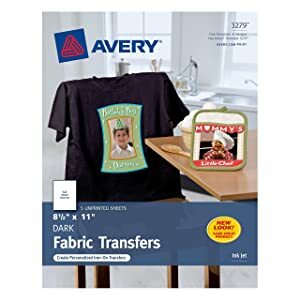 If you want a heat transfer paper that can be applied to dark-colored apparel then this Avery Inkjet transfer is ideal for you. Unlike regular heat transfer papers that only let you print your artwork on white or light-colored garments, these transfers are specially designed to work on dark-colored fabrics. These transfers can easily feed through almost all inkjet printers. The transfers have a special white coating that helps your designs or images stand out in contrast to the dark backgrounds. From T-shirts, canvas bags, pants to jackets, the 8.5 by 11 inches transfer sheets can be used for heat printing on any clothing with 100% cotton fabric. Choosing a transfer paper is the most crucial part of heat printing. Purchase a heat transfer paper that suits your specific or preferred printing method, and test all transfer papers for suitability before applying for actual customer jobs.